Kaihō Yūshō was born in 1533 in the Ōmi Province. His father, Kaihō Tsunachika was a retainer under the ruling Azai clan. He was a novice at the Toiuku-ji monastery in Kyoto when his entire family was killed in 1573. We know very little about Yūshō. 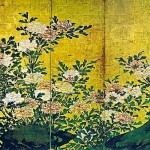 It is believed that he studied with the famous Japanese artist Kanō Motonobu. Yūshō benefited from the patronage of Toyotomi Hideyoshi (Imperial Regent of Japan between 1585 and 1591) and the Emperor Go-Yōzei (107th Emperor of Japan between 1586 and 1611). 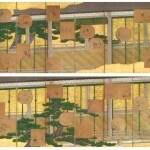 Yūshō's paintings are generally classified as being in the colorful Kanō school style of art. 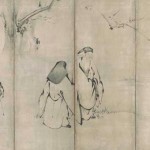 He also completed numerous works in the traditional monochromatic ink style often employed by Zen monks. Kaihō Yūshō died in February 1615 in Kyoto.